Trust me, You can actually make all kinds of yummy , airy cakes without oven...It comes out well with very light and moist texture , as those made in oven. You can either pressure cook the cake or can bake it by keeping the cake pan inside a preheated non stick vessel. 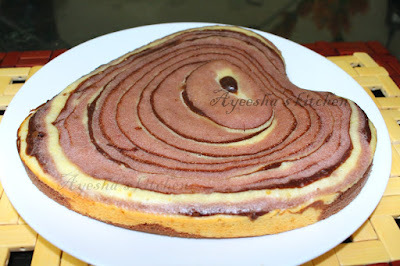 For all cake lovers,,here is the recipe of ZEBRA CAKE without an oven (a no bake recipe / stove top cake recipe)....Lets see how to make zebra cake without oven ...Stove top Zebra cake ...Really superb!!!!! Zebra birthday cakes / Zebra cupcakes are very much familiar to us which reminds of our childhood probably to many of us. 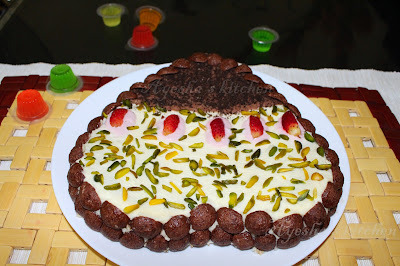 Its a combination of simple vanilla cake , strawberry cake and chocolate cake . Here are some easy no bake snacks made by me. 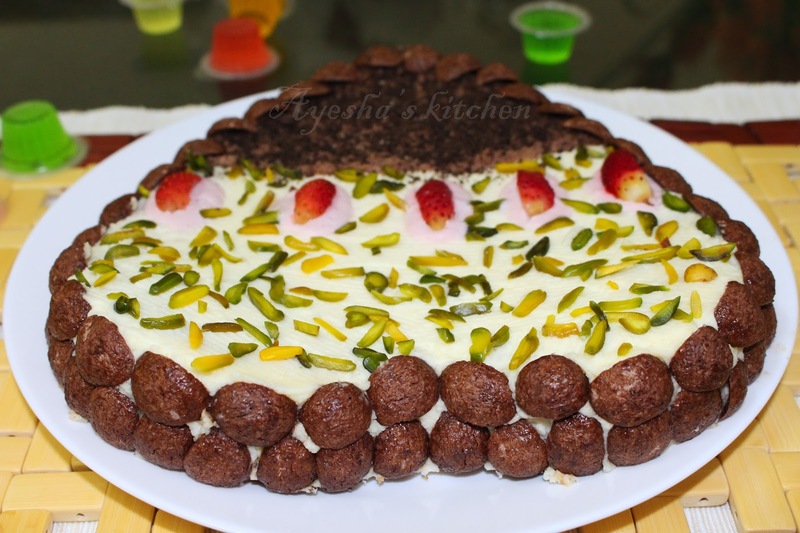 No bake Carrot cake recipe, Oreo chocolate tart no bake, Black forest cake stove top... These simple no bake recipes are kids favorite and they will surely enjoy having those desserts. Hope u enjoyed this stove top baking recipe. First we can start by preparing the whipping cream frosting. This is because, the whipping cream must be stiff while icing the cake. Else results in a watery icing. So once done, keep refrigerated until cake is done. So lets prepare the icing . For that keep the mixing bowl, wire whiskers and hand whiskers in the freezer for 20 minutes. Place some ice cubes under the bowl which is used for whisking the cream . If everything set, then pour 1 cup of whipping cream, vanilla essence and icing sugar ( if it is normal sugar, powder it in the smallest jar of the mixie) in the glass bowl . Set some small ice cubes under the glass bowl. Whisk it well until soft peaks formed. If you are using hand whisker , then it will take more than 5 minutes to get fluffy cream. You can also put whipping cream and sugar in a blender / juicer until soft peaks come out (for that u must whisk it well for 2 minutes using whisker ,then refrigerate and then only put in a blender ). Store the whipped cream inside the fridge until we prepare the cake. Beat the eggs and powdered sugar in a blender or using a whisker . ( i used blender). When done pour it to a big bowl. Sift together all purpose flour and baking powder well.Add this sifted powders little by little to the egg mixture and keep on beating until the whole flour is incorporated with the egg mixture. Add vanilla essence and again mix well. This time the batter should be of thick consistency , as we have to add the sauces of chocolate , strawberry and the milk too. Now divide the mixture into three equal portions in three separate bowls. You can use jugs for easiness. Add chocolate sauce into one bowl and mix well until a medium consistency ( not too thick nor too watery). Add strawberry sauce to another bowl and mix well until well combined. Finally add some milk in the third bowl ( add milk needed for medium consistency. Add accordingly) and mix well. Assembling this batter is the most important part. Scoop a small ladle full of plain batter and pour into the middle of baking tray. Then scoop same amount of chocolate batter and pour to the center of plain batter.Then scoop strawberry batter and pour to the center of chocolate batter. NOTE: Do not stop or wait until the previous batter spreads... Keep doing continuously.DO NOT SPREAD OR DISTURBS THE MIXTURE. It will spread by itself and fill the whole tray gradually. Continue altering the batters until you finish them. Heat a non stick vessel with lid. When hot , make the flame very low and keep the tray inside it and close the lid. Cook for 40 minutes in a low flame. Spread the whipped cream thickly over the whole cake. The cake must look white in color. If you think its watery , then refrigerate for few minutes. Or if its stiff then go on. Now decorate your cake as you wish. For more detail please watch my video . Chop the berries and add it to a vessel along with sugar and water. Bring to boil. When done turn off the flame and allow it to cool. Blend it to a smooth paste using mixie and strain it to a bowl. Grind together all these ingredients in a grinder to a smooth thick paste. Transfer it to a bowl and mix well.